All data below are the result of the RIO interpolation technique, in which the measurement observations are interpolated to a 4x4 km² grid resolution. Locally, concentrations can be higher or lower. The figure below uses box plots to show the evolution of the minimum, the 25th percentile (P25), the 50th percentile (P50), the 75th percentile (P75) and the maximum annual mean O3 concentrations in Belgium. Between 1990 and 2000, the annual mean ozone concentrations show an upward trend. From 2000, the curve seems to remain fairly constant, yet it is hard to discern a clear trend. Box plot of annual mean O3 concentrations over the period 1990-2016. The spatial average is represented by the blue circles. All data were calculated using the RIO interpolation technique. Click here for more information on how to interpret a boxplot. 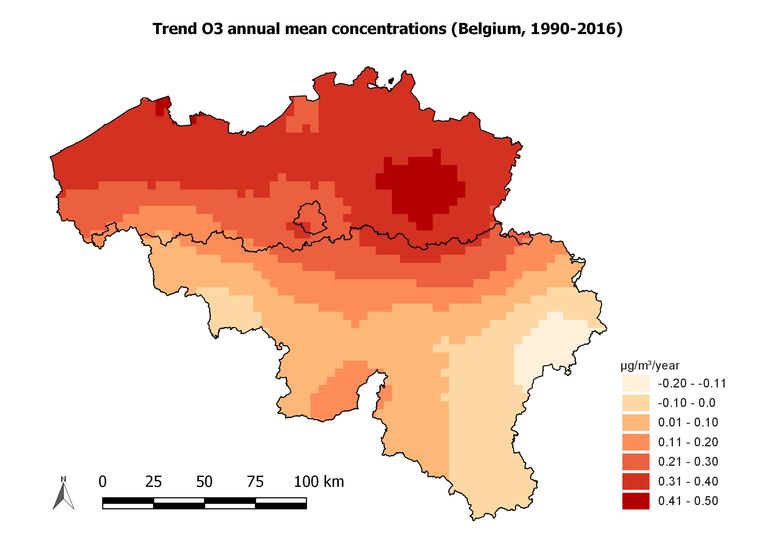 The figure below shows the evolution of the annual mean concentrations for Belgium and the three individual regions. Between 1990 and 2000, the annual mean ozone concentrations show an upward trend. From 2000 the curve remains fairly constant with values around 40 μg/m³, 45 μg/m³ and 50 μg/m³ in Brussels, Flanders and Wallonia respectively. 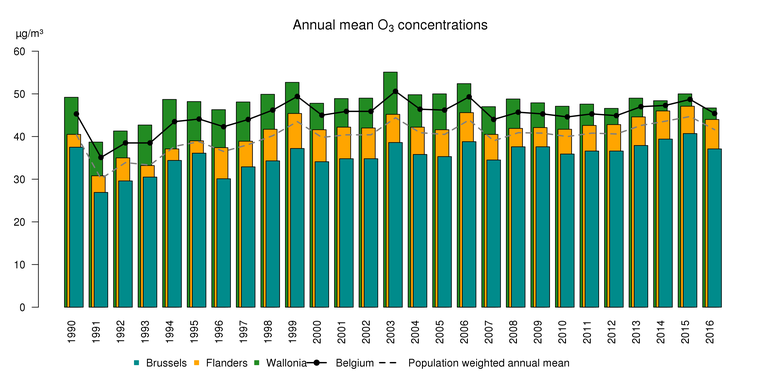 The population-weighted annual mean ozone concentration in Belgium lies between the Flemish and Brussels average. The spatial distribution of the increase in the O3 annual mean over the period 1990-2016 is shown in the figure below. The highest increases, between 0.3 and 0.5 μg/m³/year, occur in Flanders. 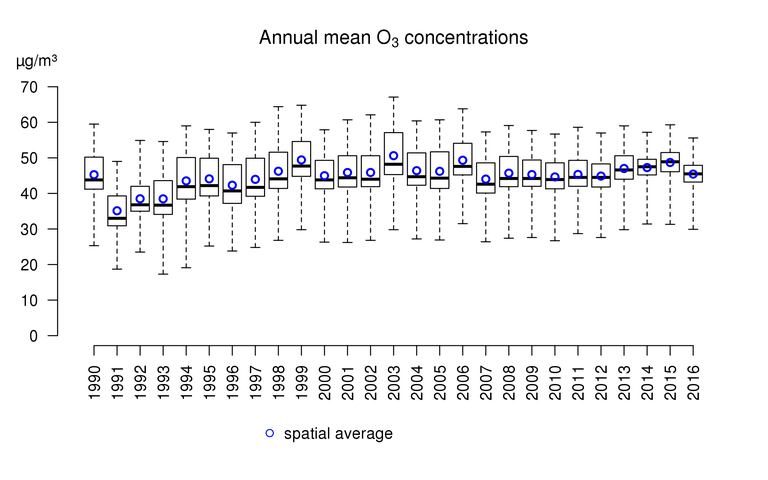 Spatial trend in annual mean O3 concentration (μg/m³/year) over the period 1990-2016. The data for the trend analysis were generated based on the RIO interpolation technique.